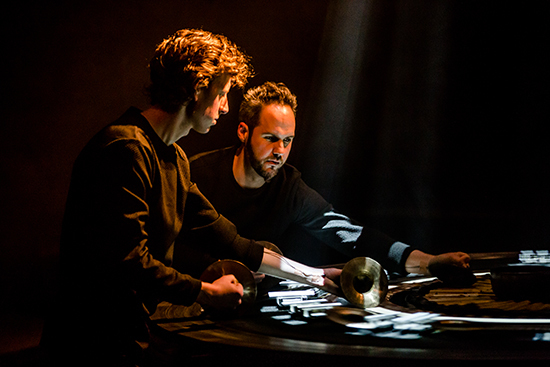 In recent years Melbourne-based Speak Percussion have continually explored experimental repertoire, showcasing their depth of talent both as performers and creators. The brainchild of Matthias Schack-Arnott, Anicca is an ambitious project with a new rotating instrument taking centrestage. Pairing this with a light installation and multi-channel audio, the event promised a multi-sensory experience inspired by Hindu and Buddhist thought. 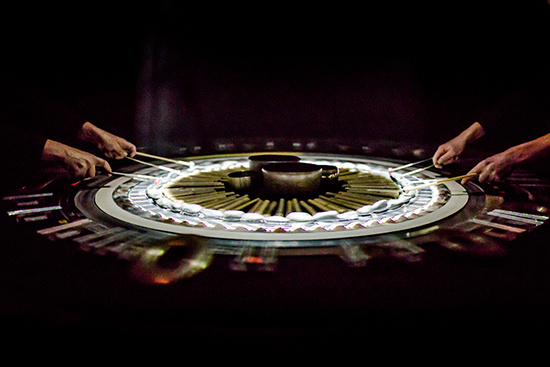 The body of the instrument stands as a large musical tabletop a few metres in diameter. Adorning its surface are concentric circles of different materials. Natural materials—stones, shells and sticks—are positioned alongside wires, sandpaper and finely tuned chimes. With the speed of the table’s rotation controlled by a foot pedal, the intricacy of both the creative and industrial design is evident from the outset. 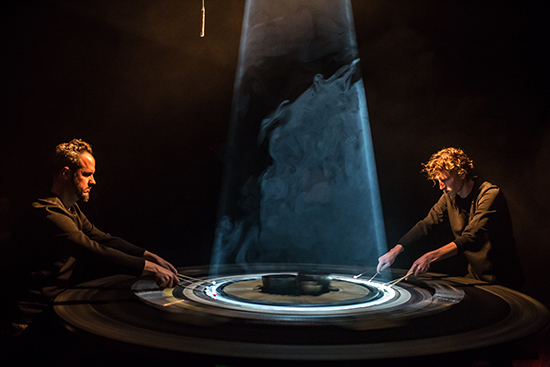 With the instrument already whirring in motion, Schack-Arnott and his musical partner, Speak’s Artistic Director Eugene Ughetti, approach it, placing cymbals on a carpeted surface. This initial eerie resonant sound continues as a thread throughout the performance, whether achieved by the friction of cymbals or through sound design. Gradually, new sound sources are introduced. First, small prayer bowls are placed with great deliberation atop the instrument, moved around and struck with mallets. Seeing the players work with the rotation is like watching gamers in intense concentration, careful not to miss a step in this deceptively tricky choreography. Like chain reactions, the other surfaces are set off with mallets; the chattering and rattling of the objects cut and pasted into a rich palette of sound, reminiscent of early tape music. The gradually changing textures and rhythmic patterns become even more hypnotic. Layering atmospheric resonances with active sounds hides changes in speed, increasing the impact of the work’s three key passages, executed with a drastic deceleration in the rotation speed and a near-complete blackout. During the first passage, a set of chimes tuned to the same pitch is spotlit by the rotating light system and struck by the players. This paring back of the busy patterns is introspective, a moment of stillness and meditation. The second round deploys chimes tuned to two different pitches, and in the final section all the chimes are illuminated and played. Reaching for large cymbals towards the end of the performance, the players draw muted chuckles from the audience. These instruments create a grand resonance; when applied with pressure to the rotating surface, the friction produces an uncomfortably high pitched grating, increasing the sense of tension before the work’s abrupt end. Making a new instrument from scratch allows for notions of music and interaction to be challenged. This work’s disruption of typical relationships between instrument and performer was one of its most striking aspects. In highly controlled sections, Ughetti and Schack-Arnott played decisively and with precise movements, striking individual chimes and prayer bowls. But the cyclic motion of the instrument played an equal part in the performance, seemingly playing itself when the musicians held their tools to its surface and let it speak. To construct a new instrument on this scale is not just a feat of engineering, but an exercise in creative musical thinking unlike any other. In their consideration for every aspect of materials, mechanics, scoring and performance, Schack-Arnott and the team behind Anicca have demonstrated their intriguing practice, producing a captivating work which felt far shorter than its 45 minutes. Read Matthew Lorenzon’s interview with Matthias Schack-Arnott and Eugene Ughetti.